We headed west southwest out deep today. We set up on the 42 west line and trolled southwest. The down temp was in the high 60’s down 75 feet, a little warmer than we thought it would be, but it got cooler the further west we trolled. We hit our first fish in the dark 75 down on an out down with a pair of regular DW Green Skinny Jeans. Shortly after landing a nice Coho a mag Green Glow out 185 on a low wire diver took a Steelhead. Our action was steady on our out troll to the 48’s west. 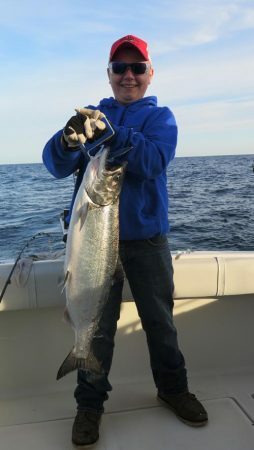 Our biggest fish, a King, took a 10″ Kevin’s Girlfriend Spin Doctor/Green Mile Big Water Tackle Meat Rig on a 350 copper. An 8″ Green Chilly Willie Spin Doctor/Pickled Sunshine Action Fly out 200 on a high wire went 3 times. We landed 2 of those. A 8″ White Slick Spin Doctor/Blue Bubble Glow Action Fly went twice on a low wire diver out 150. A UV Black Dot Starburst Super Slim on a 200 copper went twice. The other high wire went 3 times out 325 with an 8″ White Slick Spin Doctor/Liquid Sunshine Action Fly. The mag Green Glow on one of low wires only went once so we swapped it out for a 10″ White Slick Spin Doctor/Pickled Sunshine Dreamweaver Meat Rig. It went twice out 225. 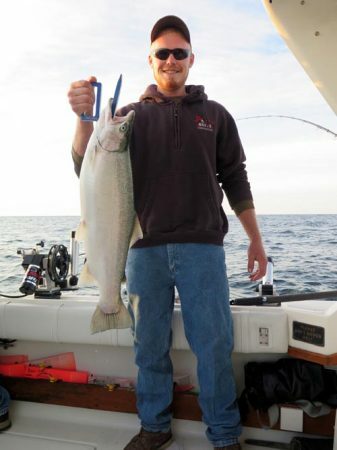 We took a big Steelhead on an 8″ Blue Dolphin Spin Doctor/Pickled Sunshine Action Fly. Our in troll wasn’t as productive as our out troll but we did take some fish. We had lots of bites this morning and missed several fish. 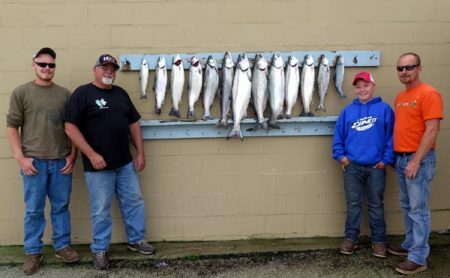 Coho & Steelhead can be tough to keep hooked. 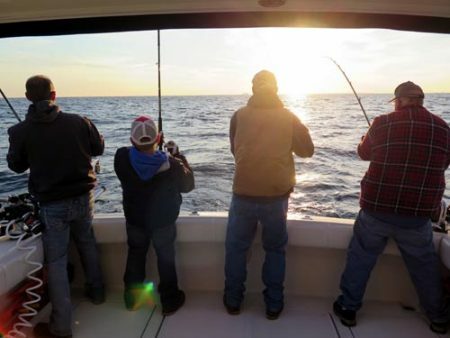 It was a fun morning and it felt good to be back out on the water after several blow days. We use Dreamweaver Premium Strips in all our meat rigs and Morgan’s Tackle copper on all our copper rods.